So many people seem to be unhappy with the exterminator they use for their pest control needs. There are many reasons why they may be unhappy. Maybe they don’t show up on time or at all, they don’t do a complete job, they are sloppy, etc. 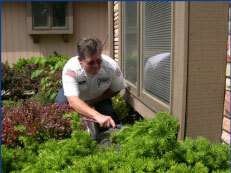 please tell us why you are unhappy with the service provided by your existing pest control provider. Even if you don’t have a current exterminator, tell us your previous experiences with exterminators you have used or have heard about. If you are happy with the service you are getting. What makes the service you receive special? Tell us what you like about the service you receive. Maybe the technician is nice, maybe hes just really good at what he does. Maybe hes low cost, or offers great service.